While trying to find a way to greet his patients but limit the spread of cold and flu, Denton physician Jason Marchetti, MD, came up with a simple solution: the fist-bump. A physical medicine and rehab physician, Dr. Marchetti developed an outreach campaign reminding people about the need for good hygiene, especially during flu season. He introduced the fist-bump as a scientifically validated greeting that can decrease germ transmission during hand-to-hand contact. “This has all of the qualities of an ideal medical intervention: it’s free, it’s safe, and it can be done easily by everyone,” remarks Dr. Marchetti. 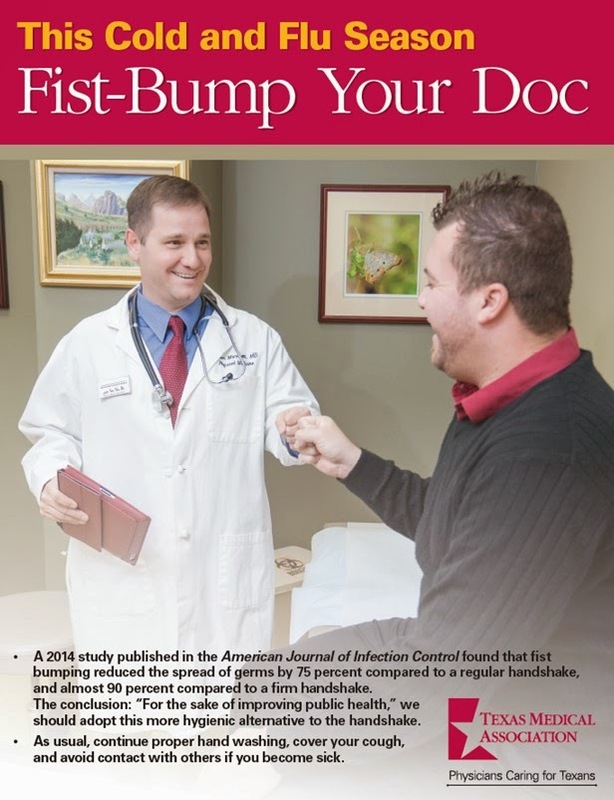 The campaign is backed by an August 2014 study, “The fist bump: A more hygienic alternative to the handshake,” published in the American Journal of Infection Control. Researchers conducted a basic experiment looking at the transmission of bacteria between hands. They looked at a “regular” as well as “strong” handshake then compared to a fist bump. Strong handshakes (firmer pressure, longer grip duration) spread double the bacteria versus a regular handshake, while a fist bump (with low pressure, brief contact, less surface area) only had 25 percent the transmittance. Their conclusion: “For the sake of improving public health,” we should adopt this more hygienic alternative to the handshake. In his own practice, Dr. Marchetti has found that patients, young and old, have embraced the campaign enthusiastically.